February 6, 2019 Two more guilds have finished Dazar’alor since Method got world first. One of them was Method again. Not content with a singular world first victory over the Dazar’alor raid, Method since managed to secure a second victory over World of Warcraft’s latest challenge – before anybody else had even done it once. Limit has since gotten the second kill on Jaina Proudmoore – the first North American guild to do so. Right now, they’re the only two groups to have done it. You can check out the clip of the original kill via the Twitch embed below, and Method’s official site has collating plenty more of the festivities. Limit even tweeted its own congratulations yesterday, saying “Huge congrats to Method for World First Jaina! Very well played, boys.” The first victory came after 346 wipes from Method in their attempt to take down Jaina. Battle for Dazar’alor is a slightly unusual raid, pitting Alliance and Horde players against the same bosses, but in a different order. That could have confused the world first race slightly, but it would seem that all of the major guilds have tackled the raid in the same order. The first few bosses went down within minutes of Mythic difficulty going live. Champion of the Light was slain by Big Dumb Guild within ten minutes, while Wildcard Gaming managed to take down Grong in a little under half an hour. Big Dumb Gaming came in hot with the next kill, but then Limit stepped up. 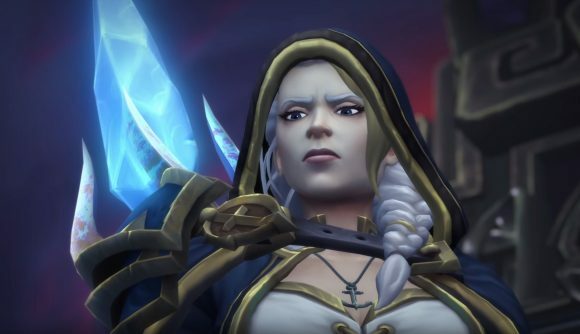 The guild claimed world first on the next five bosses in a row, leaving only Jaina Proudmoore in their way, but overnight Method has caught up. The UK guild finished off a series of bosses in quick succession, claiming world second for penultimate hurdle Stormwall Blockade. From there, however, it became pretty slow going. The final boss of the Uldir raid took Method more than a week to complete, with Mythic G’huun only falling after nine days (and a pretty hefty nerf).